According to a North American meteorology book I once had, the United States is affected by 13 storm tracks, and 10 of them are capable of working their nastiness in one manner or another on the Adirondacks. Perhaps that is why, as the popular saying goes, if you don’t like the weather around here, wait five minutes. 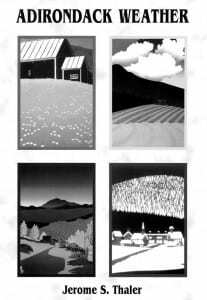 While you’re waiting, read Adirondack Weather, a new book from Jerome S. Thaler. You’ll discover that no matter how weird the weather might be at the moment, at some point in the not-so-distant past it was doing something even weirder, more extreme and/or less explicable. Thaler is known throughout the Hudson Valley as a weather documentarian and historian. Now he has turned his weather eye north and applied his expertise to the Adirondacks. Thaler clearly knows his stuff; he not only describes the weather, but also explains in accessible language why it behaves as it does. The thing most people want to know when it comes to weather is extremes (and in the Adirondacks, most of those involve winter). Thaler gives us all that in enough detail to satisfy even the most obsessed, but he also gives us the context. Thaler begins with discussions of Adirondack climate zones (there are more than you might think), topography (which helps explain the number of climate zones), climate history and weather phenomena. In the latter section he notes that “a tornado can be expected once every five years somewhere in the Park,” although these are normally not the monsters that make the national news by grinding up whole towns. Here he also mentions the Great Blowdown of November 1950, when 105-mph winds spinning off a late-season Atlantic hurricane affected the forests for years, and the 1995 microburst—a “derecho” in weatherspeak— that killed five campers and destroyed 65 homes. Floods, droughts and the 1963 landslide that created the signature scars on Giant Mountain also get their due. 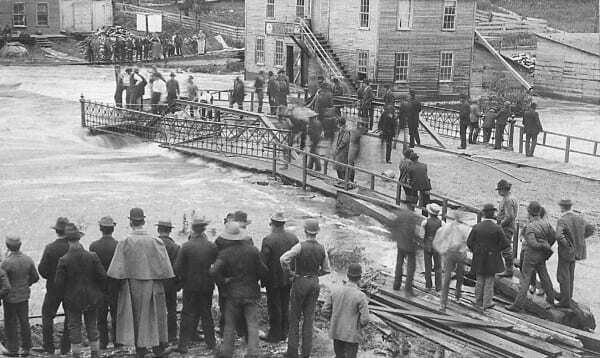 The Bloomingdale flood of 1892. He then turns to the seasons, beginning with spring. There’s some insightful writing here. Thaler reminds us that in the Adirondacks, “March is not spring as we would like it to be.” He also notes that “one defining aspect of Adirondack spring is the ‘Ice Out’ date on local lakes,” which, as one of the innumerable tables shows, might not happen until May. This is followed by more in-depth analyses of each month. In the section on January, Thaler authoritatively describes how Adirondackers determine how cold it was last night: “If a man admits that it was 20 below zero on his back porch, his neighbor only a few hundred yards away will report a temperature of 25 below. This sport does not require a thermometer, just a little advance notice of the temperature reported from other places.” This should not come as too big a surprise to those who follow Adirondack weather, for it is a matter of pride that the Adirondacks are often identified in national weather reports as the coldest place in the Lower 48. There’s no point in trying for impressive high temperatures, after all; we simply can’t play in that band. So we may as well go for the low end. This strategy, it should be noted, works for snowfall too; after a good pasting, the depth is whatever we heard last, plus two inches. On Feb. 17, 1979, it was 52 degrees below zero in Old Forge.  On Jan. 16, 1995, it was 59 degrees above zero in Old Forge.  On May 13, 1996, Ray Brook received 6 inches of snow. 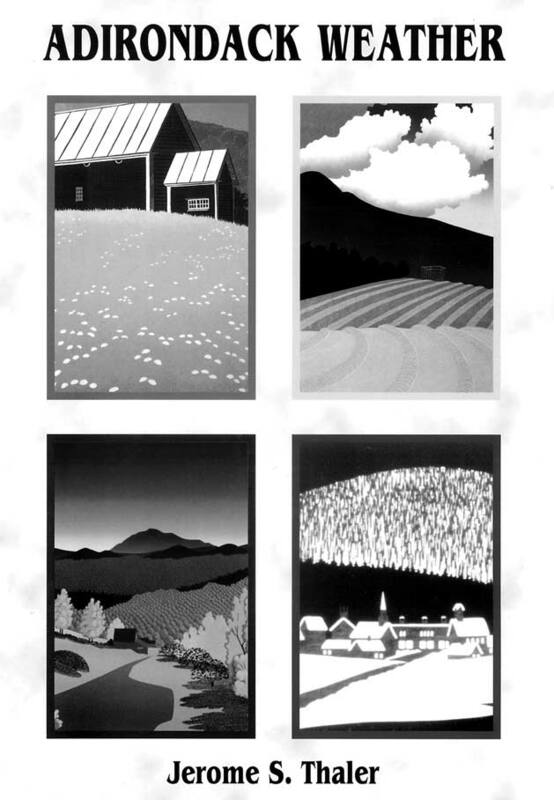  On July 24, 1986, Newcomb recorded frost. 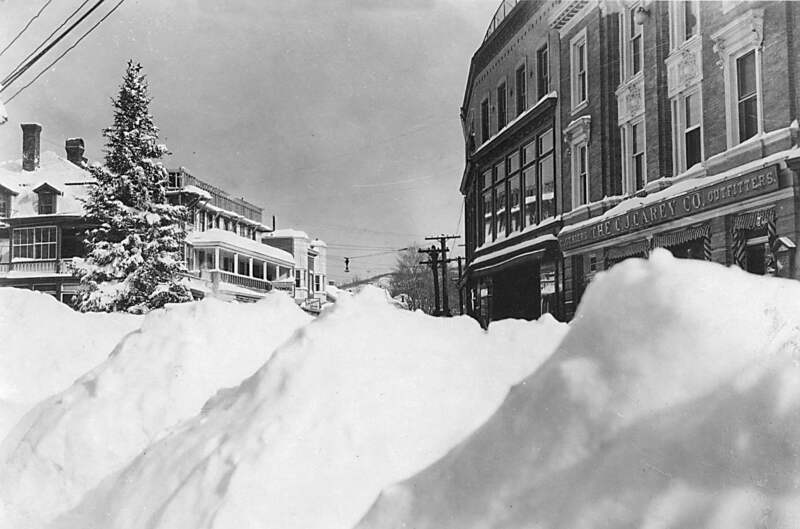  On Nov. 19, 1911, Tupper Lake was buried under 19 inches of snow. This is followed by a list of annual, as opposed to daily, notable weather facts, where you learn that in 1953 the Adirondacks had a heat wave in September and that 2002 was the warmest winter of record. An occasional contradiction creeps into the statistics. In discussing snowfall patterns across the region, Thaler says that Lake Placid and Tupper Lake have had “no single day of total snow exceeding one foot.” Longtime residents will no doubt contest this, and in fact you’ll find on the next page a list of “memorable 20th century snowstorms” that says the Tri-Lakes Area was “crippled by 26 inches of new snow in 24 hours” on March 4, 1971. Main Street in Saranac Lake after a blizzard in January 1925. While the content of this book can be fascinating, the print quality leaves much to be desired. There are few illustrations and they are not reproduced well, some of the maps are fuzzy, and some of the tables are tough to decipher. Mark Twain is credited with originating that overused canard “Everybody talks about the weather, but nobody does anything about it.” That was some 125 years ago. We still aren’t doing much about it (such as reducing our use of fossil fuels to slow global warming), but if you familiarize yourself with this book you’ll at least be able to talk about it more impressively.